Donald Trump has a new message for American families: I'll help you out with child care. Trump believes it's time to lower child care costs, which are now more expensive than rent for many families. His solution is a big tax break. 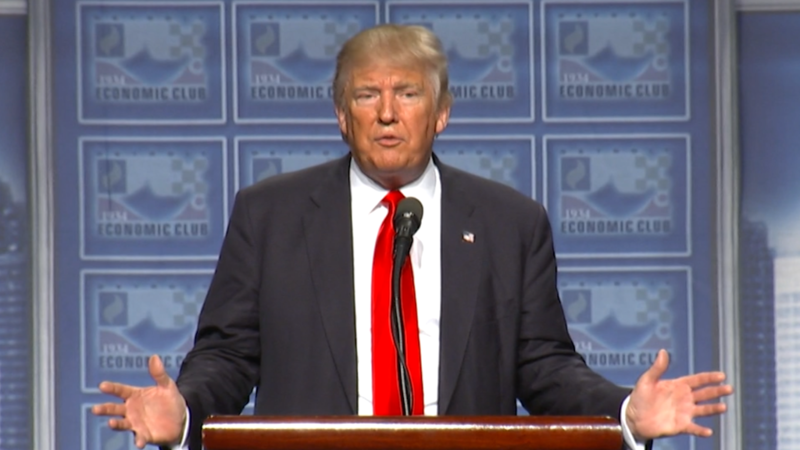 "My plan will also help reduce the cost of child care by allowing parents to fully deduct the average cost of childcare spending from their taxes," Trump said Monday in a sweeping economic policy speech at the Detroit Economic Club. There aren't many details yet, but the message is clear: Trump wants to look family friendly. At the moment, parents can deduct up to $6,000 for child care expenses from their federal income taxes. Trump would raise that substantially. Trump is fighting to regain momentum in the polls, especially among women. His rival Hillary Clinton has been campaigning as a champion of children. She wants to have universal pre-school for all 4-year-olds in America and to cap child care costs at 10% of a family's income. At the Democratic convention, numerous speakers cast her as a "mom-in-chief" figure. Now Trump is eating into Clinton's turf with a plan of his own. Experts warn that Trump's plan is very complicated and appears to favor the wealthy. "Trump has identified a real challenge affecting working families, but his proposal would do little or nothing to help them," says Elaine Maag, an expert at the Tax Policy Center. Notice that Trump said parents could deduct the "average" costs. It's unclear what that means exactly, but it implies there would be a cap on how much could be deducted. Could rich families write off an expensive nanny? Another key is that Trump called it a child care tax "deduction," not a credit. In order to take advantage of a deduction, a person needs to have income above $0 on their federal taxes to begin with. Forty-five percent of Americans currently do not have that, according to the Tax Policy Center. The Trump campaign is fighting back against criticism that this proposal won't help the poor. In a statement to CNNMoney, the campaign said "the plan also allows parents to exclude child care expenses from half of their payroll taxes -- increasing their paycheck income each week." The working poor do face payroll taxes for Social Security and Medicare, so a payroll tax break could help them out. But experts say it would be hard to administer. Then there's issue of how Trump would pay for his plan. The current child and dependent care credits will cost $24 billion over the next five years, according to government estimates. Since Trump wants to increase the benefit, that comes with a higher price tax. Trump promises more details soon. In the meantime, there's acknowledgment this is a good start. "Who would have thought the trump campaign would feel they've got to get the game of supporting policies around working families?" says Victoria Budson, executive director of the Women and Public Policy Program at Harvard's Kennedy School of Government. "I think it's great to do, but it's only one small step." Child care costs now exceed rent in most states, according to a report by Child Care Aware of America. A family with an infant and a 4-year-old in daycare now pays almost $30,000 a year in child care costs, according to Child Care Aware. Under current law, parents can deduct expenses for daycare for children who are under age 13. Trump has yet to provide details about whether his child care tax break would have similar rules. Trump's child care proposal was likely inspired by his daughter Ivanka Trump. She surprised many at the Republican National Convention when she said her father was concerned about how expensive daycare was. She said he would have a plan to shrink those costs. "He will focus on making quality child care affordable and accessible for all," she said.